New Delhi: Government of India, Ministry of Personnel, Public Grievances &Pensions, Department of Pension and Pensioners Welfare has issued orders regarding Revision of Pension in respect of Puducherry pensioners /family pensioners drawing pension under ex-French Rules on the line of revision of pension of Central Government Pensioners on the recommendations of VIIth Central Pay Commission on 21st July, 2017 to The Chief Secretary, Government of Puducherry, Puducherry. Ministry of Personnel, Public Grievances &Pensions, Department of Pension and Pensioners Welfare has directed to say that the question of revision of pension of Puducherry pensioners / family pensioners drawing pension under the Ex-French Pension Rules in line with the revision of pension for Central Government Pensioners as per this Department O.M. No.38/37/2016-P&PW(A) (i) and (ii) dated 04.08.2016 has been under consideration of the Government of India. The President is now pleased to decide that the Puducherry pensioners and family pensioners shall also be eligible, as a special case, for benefit of revision of pension as enumerated in this Department’s O.M. dated 04.08.2016 referred to above i.e. by multiplying the pension /family pension, as had been fixed at the time of implementation of the 6 CPC recommendation by 2.57. However, the order regarding revision of pension as per Pay Fixation method available to the Central Govt. Pensioners vide this Department’s OM No. 38/37/2016-P&PW(A) dated 12.05.2017 shall not be applicable to these Ex-French Pension Rules pensioners / family pensioners. The pensioners! family pensioners, referred to above will also be eligible for dearness relief at the revised rates effective after the 7th CPC on the revised pension as per orders issued by the Government in this regard from time to time. The pension/ family pension will be revised in terms of these orders by the Govt. of Pudicherry in each case individually and the revised pension payment orders will be issued to the concerned pension disbursing authority for arranging payment. It may be ensured that proper and thorough physical verification of the beneficiaries is carried out before revision of pension / family pension. The above mentioned benefits shall not, however, be admissible in the case of Pensioners / family of the deceased pensioners who have opted for French nationality and are drawing metropolitan Pension from the French Government. These orders issue with the concurrence of the Ministry of Finance, Department of Expenditure, vide their ID. No 30-1/33(iii)/2016-IC dated 13.07.2017. 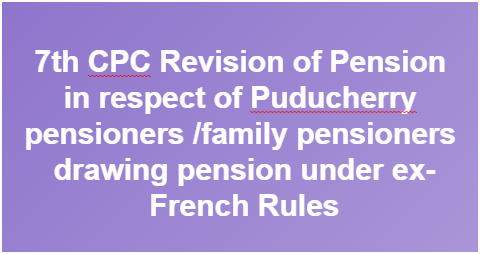 Revision of Pension in respect of Puducherry pensioners /family pensioners drawing pension under ex-French Rules on the line of revision of pension of Central Government Pensioners on the recommendations of VIIth Central Pay Commission - regarding.